In this segment, I am going to semi-rant about a piece that I am working on, how I do it and how it all works out in the end. I shall keep it brief, and update once a week with photos so that you can follow along. This is the beginnings of a piece that I have planned to do for a long time, a life-size standing female figure. I began it, in fact, January 27, 2009 and that is the date of this photo. 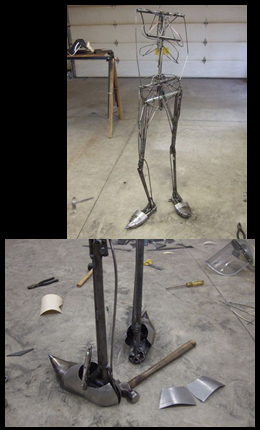 What you see here is the armature on which the sculpture will be built. It is created out of welded steel rod, and tubing. With the building of the armature I am able to establish the pose, proportions of the figure, and create a support system for what is to follow. What is to follow? Usually my sculpture evolves from a full-blown image completed in my head, waiting to be built. I have decided to stir the pot and break my habit. 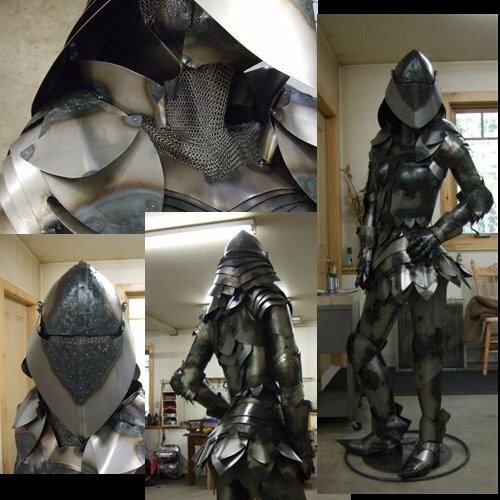 I am going to invent, for that is what the process will entail, a female suit of armour, starting from the feet and working up. I will challenge all forgone conclusions and traditions and break a lot of rules, for that is what art is all about. Although I like ‘Ironica’ as a name, my children have suggested ‘Joan of Art’ and ‘Suit of ArmHer’ as alternate titles. We’ll see who she is and who I am when we are done. For me, sculpture is not just a study, nor is it just an object. It is a story. Each of my works has movement and life, because that is part of how the story is told. Sometimes the story is not my own in the end, because in the process of completing it, the subject has found a voice. I suspect that will be the case with this sculpture. She has already asserted herself: walking confidentally, then stopping, feet firmly planted, left foot slightly pronated with the twist of her body as she strikes a pose. Degas usually established foot position first in his paintings, knowing that it was essential to the character of the figure. The shoe is the thing, now that we know where she stands. Having been called the Imelda Marcos of Muskoka (she is famous for many closets of shoes! ), it 'behooves me' to maintain my reputation. The soles are steel plate cutouts of my own foot, and now I must create fashionable footwear in keeping with a metal wardrobe. I have layered curves of steel on the tops of the feet up to the ankle, and now I am completing the backs of the shoes... hammered heel sections. The shoes look as if they will bend as a real foot is flexed,and I will simulate tiny rivets at each intersection of steel sheet. I guess things will slow down a little now... the legs will be quite complicated, with all the muscles and flex points... ankles and knees and hips, and doing two of everything. Some of the sections will be flat curves like the tops of the shoes. Other sections will be more sensuous looking, in that they will indicate the shapes underneath. So, as I hammer out the calf, I have given her ankle bones. 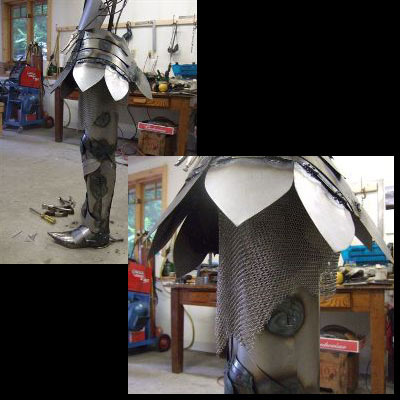 I am starting to learn the parts of the armour as I go along; the shoes are called 'sabatons'; the calf sections, front and back, are called 'greaves'. You can see the little rivets on her sabatons, and on the inside of each instep I have created a little hasp so she can take her shoes off. Perhaps they will show up better in later shots. I will repeat those hasps throughout the sculpture,and make little hinges, so that when you walk around her it will seem as if she can open the sections to put them on. I guess no-one will think she is comfortable no matter how many hinges and hasps she has. But somehow, she already looks so confident (is it her stance?) that I do not think being comfortable is a big deal for her. 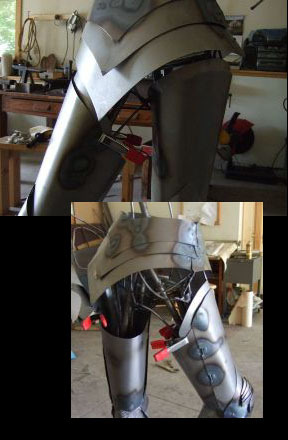 The lower legs are basically complete, with greaves front and back, fitted and hinged and hasped. 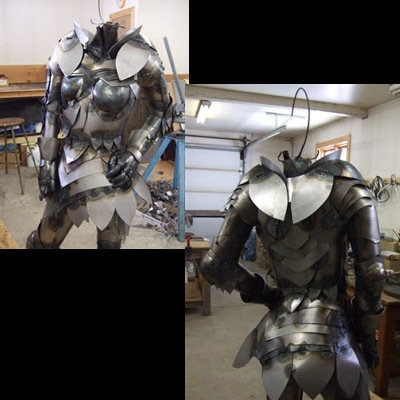 As I continue to clad the body with steel sheet, I will introduce chain maille to the mix. Here it is at the back of the ankle, and I have used a little bit as trim at the front of the foot... don’t know if I like it there... will have to decide. I maintain that the time away from a sculpture is as valuable a working period as the actual hands-on. An artist works 24/7, because the brain is solving the problems of a piece subconsciously. I will walk into my shop tomorrow, see the sculpture with new eyes, and will have already made the decisions about changes or corrections. Sometimes it means taking a leg off and starting over. That’s why the Muskox has the unique feature of three sets of eyes... one set over the other, as I corrected and corrected the head... triple vision. 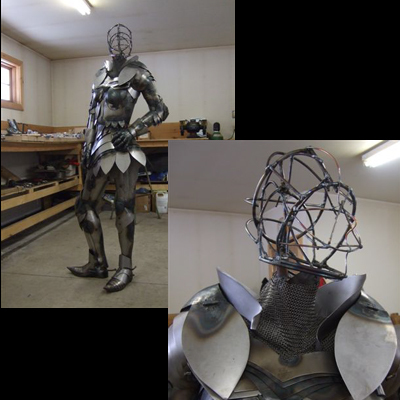 Now that you are in the groove, I am going to use ‘armour speak’ to describe this work from now on. I have realized that as I work on each section from the sabatons up, that I cannot move on until I am sure that that area is essentially complete. It has taken me awhile, therefore, to finally weld on the poleyns, for they have been on and off as often as I have knelt on my own! The reason is the greaves. I have struggled with them, hated them every time I came fresh into the shop. I then foolishly decided to start a ‘motif’ at this juncture, and I welded steel feathers to the fronts of the calves. You will never see them, for they did not work at all. They sit leaning against a wall in my shop as a reminder. I’m calling those greaves “grieves”. I had to start over, dismantling the lower leg, and hammering new parts. 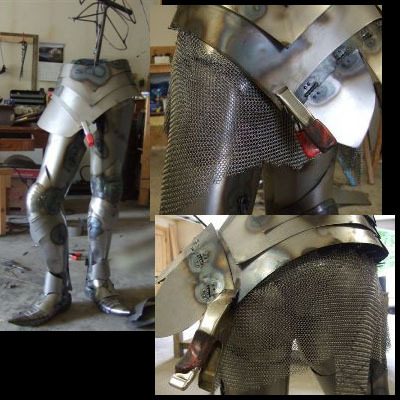 In these photos you can see the hinges and hasps, and the curved and riveted sections of the poleyns, which would allow for mobility when the leg is bent. The plates that cover the thighs are called cuisses. This sculpture is fighting me every step of the way, but that is okay. I guess that is who she is, inside all this. And eventually we will be friends. I am making paper patterns as I plan each section,fitting and refining them before I cut the steel. I then tack the steel on the figure and make any further corrections before I weld it on permanently. The steel is a 22 gauge mild steel, which I cut with a shear. 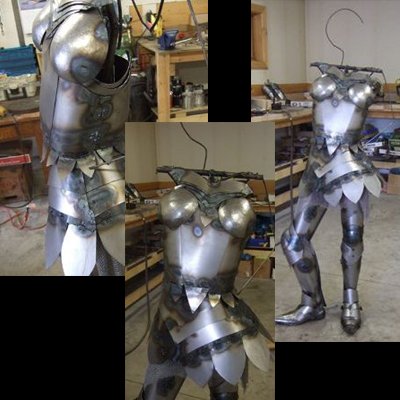 Having finally resolved the legs, I can now begin the body armour. It is nice to get away from the fiddly stuff, like poleyns, for awhile. 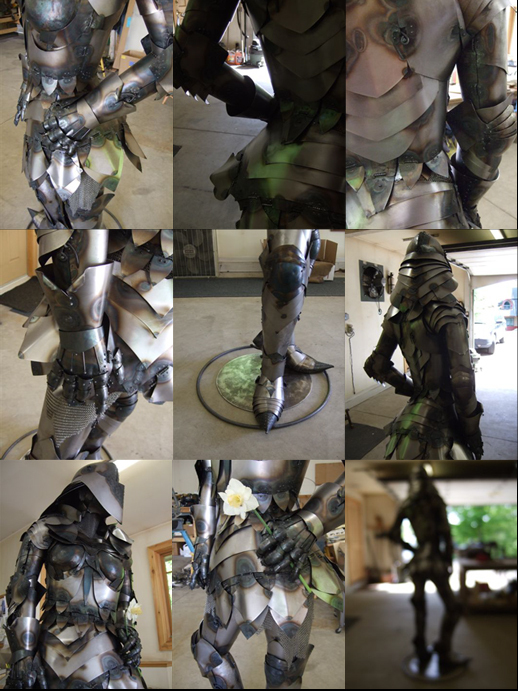 Any illustration, or photo, or even real armour shows the figure standing straight and tall as manly men do. But this one is all girl, so she won't be standing like that, she is on the move! The swing of her hips is going to complicate things. The fauld, therefore, is tipped to one side. This is a difficult (what am I saying, it is ALL difficult!) 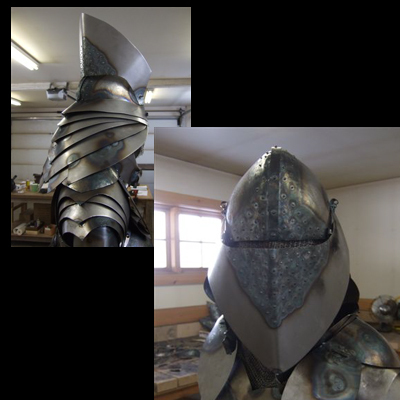 portion of the armour to resolve. She must be able to sit down, possibly on a horse, so a solid piece will not give her enough flexiblity. I finally solved it with flat hinged panels. Looks more like the 1970s than the 1470s, but they say that if you wait long enough everything is back in style. First I must attach the chain maille. The sequence is tricky, because I must not accidentally weld the chain maille (or melt it!) so I have to plan it strategically. 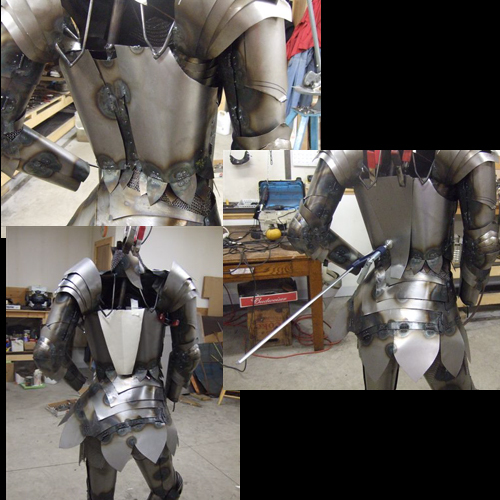 I have chosen, as mentioned, to use a series of hinged flaps on the tasset, not unlike some I have seen on traditional armour. It actually adds a degree of humour to the piece, which is allowed. Since I am breaking rules, including my own, why not? This will require a lot of detailed work, creating the hinges and fitting them, but it is a jewellery-like detail that I am quite enjoying as the sculpture evolves. 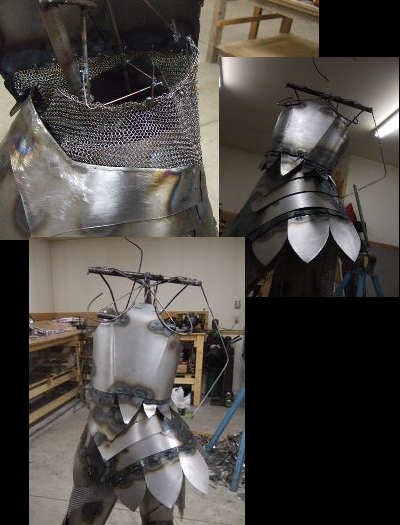 Ironica is a combination of so many metal techniques already, as I solve each area as I come to it; hammered curves, flat cut shapes, bends and folds, and a lot of internal engineering to install the chain maille with a minimum of waste. I have to do so much thinking, standing back, questioning, reading and looking at images, thinking sometimes that I am just a hacker. Then I have fleeting moments where it all works and I know why I am doing this...a welder's high. I make the little hinges by hand and slot them into the carapace so that it appears to function. Two little suggestions of rivets top and bottom explain their attachment. The hasps are hammered rod, fitted into a small loop welded into a slot. The hasps actually work before I weld them in place. But because Ironica will be stepping out IN this, rather than stepping OUT of this, I weld them into position. Each of these bits is made individually, and they have that look. I have no illusions that any part of this sculpture will look precise and perfect. As always, I want to show you that my hands have been involved in the creation of the piece, with all the tics and foibles of a live performance. 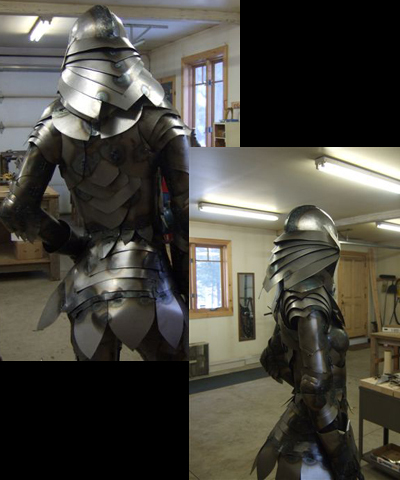 Because this sculpture is in many ways an elusive illusion, I am suggesting the principles of armour but not necessarily executing them in reality. 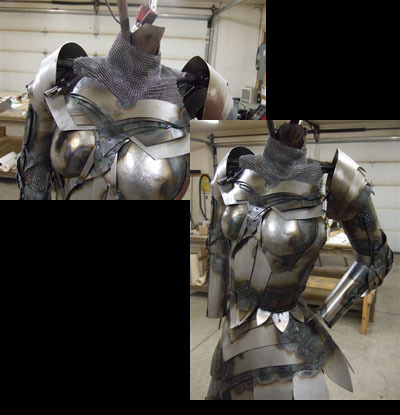 For example, I am suggesting a full suit of chain maille under the armour, but I do not want to actually use hundreds of dollars worth of maille when I can simply install it where it will show as the figure moves. You will see it at the ankle and the knee, and hanging below the tasset. Now it will also show in the space between the fauld and the plackart, in other words, at the split in the sections where her waist occurs. Because I cannot weld the chain maille without damaging it and discolouring it, I have had to work out a series of steel rods to suspend it so that it looks natural. And now I will place the front of the plackart over it. I have decided to continue with a smaller version of the hinged panels to extend the upper body section and give her room to move, because of the twist at the waist. The plackart back is completed on the bench after a lot of fitting, and now I have tacked it on the figure and will fit and weld it permanently. The slots for the side hinges are visible here. 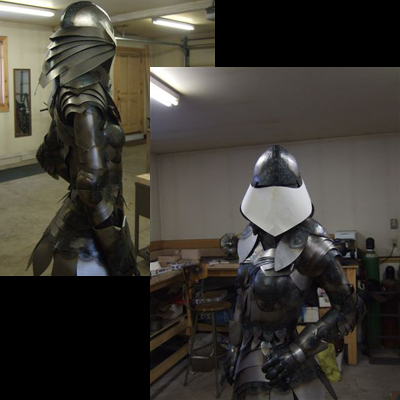 As I complete the upper body the character of Ironica is really taking shape. I turn her a little each day as I leave my shop, so that when I come back I have a completely different angle to evaluate. "I dreamed I was Joan of Art in my..."
Each of my life-size sculptures has a heart. Somehow at a certain point in the evolution of a work, I just know instinctively that THIS person is the one to make the heart for the piece. It is obvious and clear and I never doubt my decision. I introduce the thought to the individual as soon as I know, so they can think about it for awhile. They never take it lightly! There will be a point somewhere in the future when I am close to closing in the chest, and then I ask for the heart. It is all part of the creative process... mine and theirs. 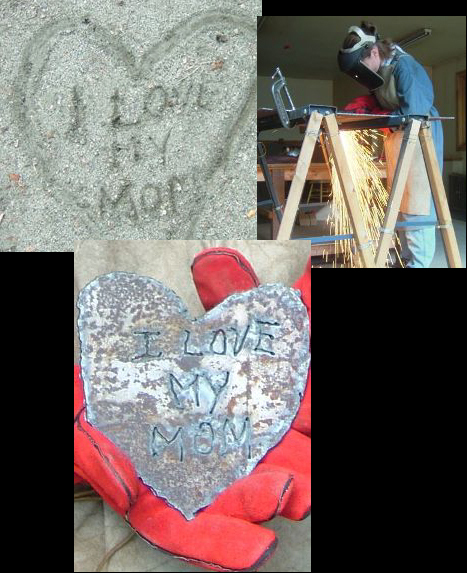 The heart can really be anything, as long as I can physically weld it inside the sculpture...a talisman, a chunk of something that can be part of its being. Without eyes to see, or hands to comfort, Ironica has already been a witness to real life, with all its joy and all its grief. So, of course, I simply chose a powerful and beautiful and brave woman who will make a difference in our world to create this heart. Having spent so much time on the lower body, it is really enjoyable to get up off the floor and work at standing level. 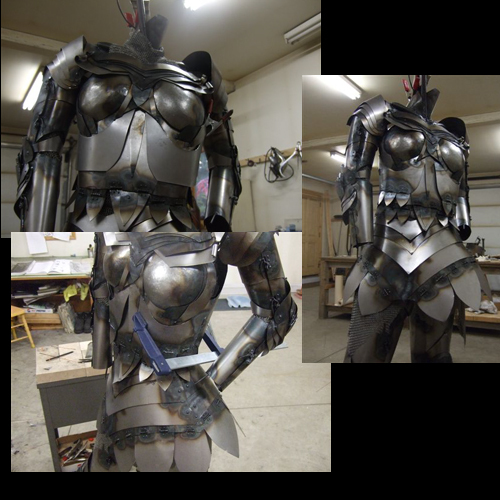 And now, the breastplate is essentially established on the figure. It is time for Arms and the Woman. I keep stalling, because I know that when I finish the arms, I have to do the hands! 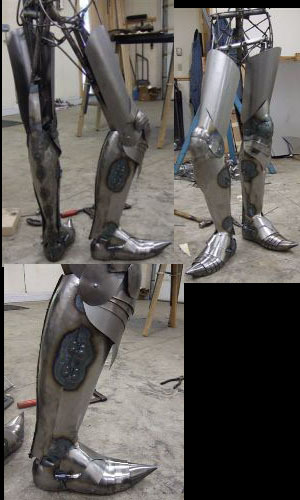 The rerebrace is the upper section of the arm, and I have hinged and hasped it to echo the look of the greaves. 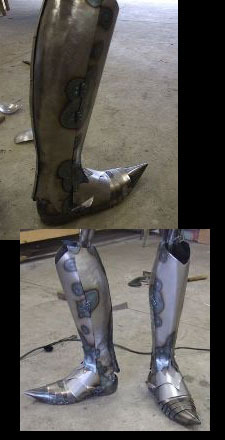 Then, as usual, I have used paper to create a pattern for the vambraces, and then made them out of steel. At each stage, I learn so much. I have always felt that art is not only inspiration and interpretation, but also problem solving. That was certainly an essential part of my training at OCAD; the teacher would 'set a problem' before you, that is, the parameters of a project, and then we as students would 'solve' it, each in our own unique way. We would learn so much from our own effort, and equally from the results of others. 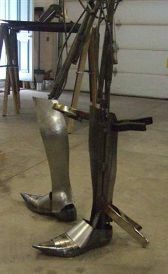 This sculpture, perhaps more than others, emphasizes problem solving. I have given myself the task of freewheeling my way through what is a traditional metal image, without a maquette or drawings. It is an anatomical study, encased in a carapace of steel. As I begin the overlapping sections of the couters, you can see the swage block which I have used for my concave surfaces. I always wear ear protection when I hammer, by the way. Metal shops are very challenging to the ears, even if you work alone. 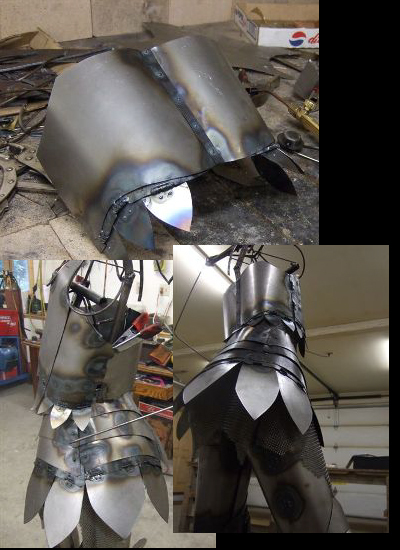 Of course, the original creators of armour did not have a welding torch to assist the process, but I must use it to tack the pieces together. Then I attach the elbow guards to the rerebrace and the vambrace. Ironica now has more to say, for she can now reach out and gesticulate and make a statement about who she is, even without hands. And, in the background, LOOK at all the steel shards under my Beverly Shear! At this stage, I should draw your attention to a feature that has not been mentioned for awhile: bone structure. Ironica shows a few glimpses of her physical being, at the ankle and at the waist, and now, at her neck. I have decided to have part of her neck revealed, if only to give her a little flexibility to toss her head in defiance. I have created the bone structure of her clavicle and the cords in her neck as she turns her head. Now when I apply the chain maille to that area, it falls into the contours, and allows a simple, feminine gesture. I could tell you that this was research. But you know, in fact, that I am stalling, because the hands are going to be so hard to create. I have added another layer to the plackart (or plackard), to give it more character, and to give her room for a ribcage. 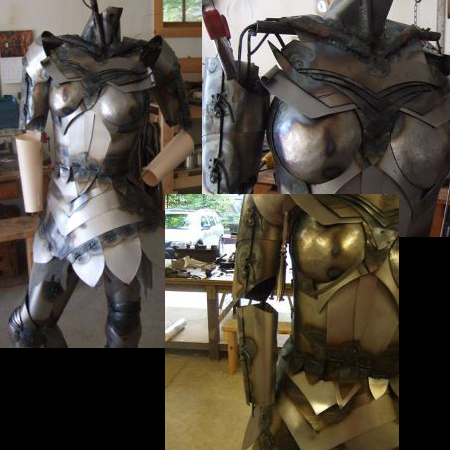 She was looking a little too slim, and accounting for the degree of movement needed inside this portion of the armour, I decided that she did need to be able to breathe. There is a bit of confusion on my part about names for this section. Various descriptions define the breastplate as the cuirass, and it covers the breast, but not the back. But then cuirass is at times used to describe the breast and back sections together. 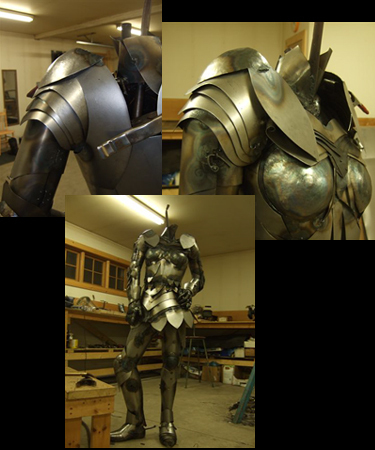 In some cases the breastplate and the belly portion are all one piece. The plackart is an extra layer of armour to cover the belly. So that is what this is... with yet another row of hinged flaps for mobility. 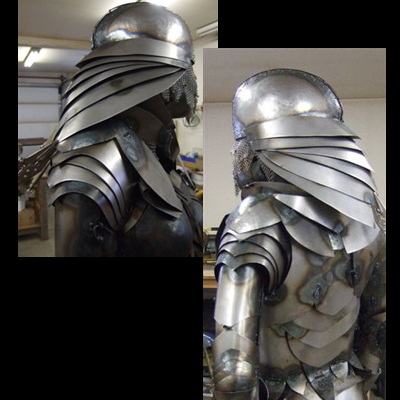 Now having added the second layer of cuirass, I must solve the join at the back. I have used the usual method of using a paper pattern which I cut and trim and fit until it looks right. 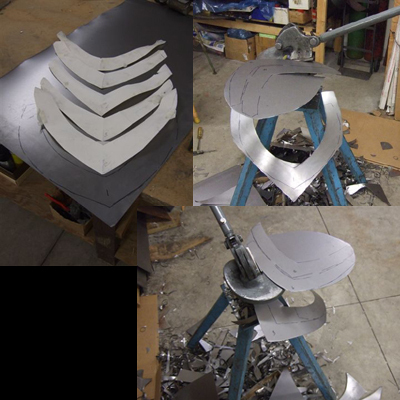 When the steel is cut from this pattern, I then use clamps to attach it to the sculpture. Once I am happy with the shapes and the curves, I commit with welds. I have tentatively begun the spaulders, but I know that they will change a few times before I am satisfied, so they are just tacked on temporarily. Each section has its right time... can't rush it. Most artists, whether they draw, paint or sculpt, find hands a huge challenge. Some artists avoid them altogether, and will have the arms taper off to nothing, very artistically, mind you. It is really quite ironic, because artists are people who create with their hands. I will not be getting away with faking this essential ingredient. I wear gloves all the time to work, and they have taken on the character of my hands. So I began by studying the glove itself, in order to understand the gauntlets I was about to create. I traced my own hands, and cut them out in steel, just as I had traced and cut out the soles of my feet so many months ago. I shaped them, with hammer and torch to create the palms. 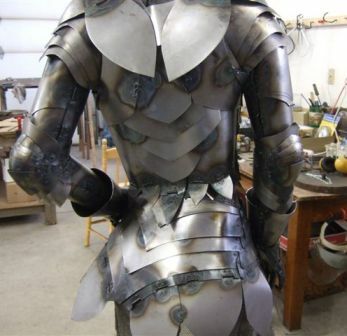 Ordinarily the knightesses would wear a maille glove, and the armour portion would be attached to the back of that. 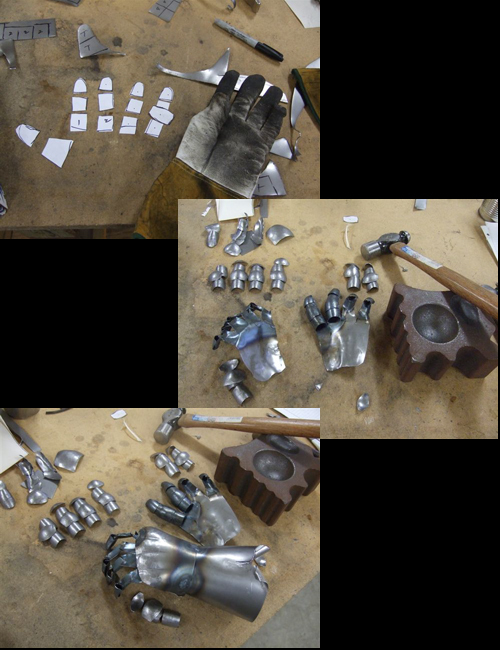 Then began the painstaking task of cutting sections for each finger, and shaping them, and assembling them. I attached them to the upper part of the gauntlet, which I had hammered and welded. They are still flexible enough that I will be able to clamp them to the vambraces, and then shape them to sit on the fauld and tasset, respectively, before I finish them permanently. I have begun the spaulders... they may change several times, because so far I am not happy with them. And the battle against rust has begun... I am consistently spraying the piece with oil to maintain it. Touching the steel with bare hands can be costly... the next day my handprints are immortalized. Digital photography has been a revolution for me. Welded steel is very hard to photograph... it is quite monochromatic, really. For all the years of my career, I have attempted to photograph work in progress in my shop. In those years of film, I would take the shots at each stage, send them off to be developed, continue to work on the piece, get the photos back a few days later, and discover in the blurry results that I had lost the moment forever. Now, I can digitally take numerous shots from every perspective, have the ability to edit and zoom, and I know immediately whether I have captured it or not. There is another benifit to the immediacy of this technology; when I view the shots on the computer, removed from the shop and the work, I often see changes I must make. It is as if the camera becomes the viewer, rather than me. One step removed allows me to be objective. The race against rust has been interesting. Now for Hands Part 2! After stalling for so long, I am actually finding this part quite intriguing and delicious. Will I ever learn? When I was building my Moose, I was in a shop space that I rented for the duration owned and operated by a remarkable welding human being. The Moose was BIG and heavy and complicated and my mind would leap ahead to the problems I anticipated in the next stages of creating it. Ron had two phrases: "Nothing is impossible", and "When the time is right, you will know what to do". Those maxims have proven true over and over, after the fact. I only wish that with each new dilemma that I believed it before I tied myself in knots. 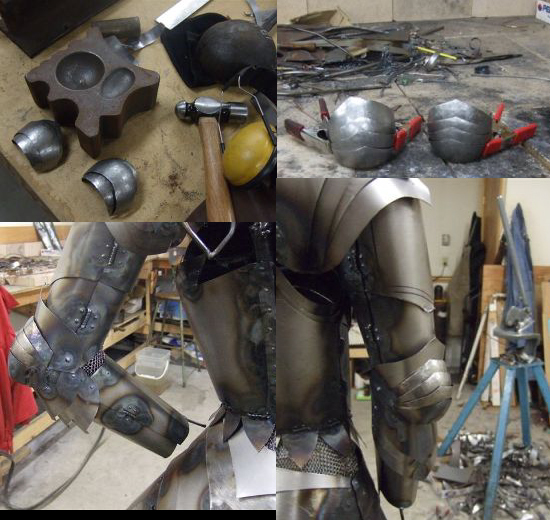 I have tacked the gauntlets to the vambraces and fitted them, and then carefully removed them to do the details on the bench. Now I will weld them on permanently. 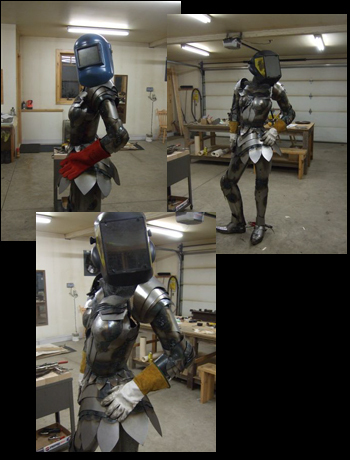 The finished gauntlets have added even more womanity to Ironica. The spaulders are the bands that telescope on the shoulders of the figure. They were simple enough to resolve, echoing the shapes of the couters and the poleyns (elbows and knees). 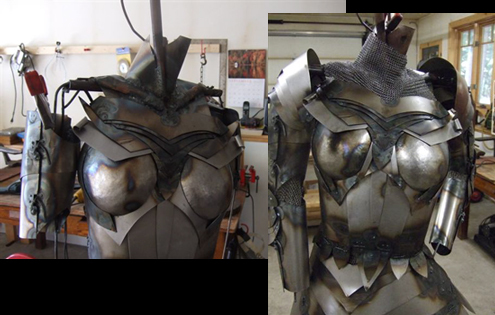 Now I must design the pauldron so that it covers the shoulder and her ' wings', and integrates with the breastplate and the chain maille gorget. Finding the shape is crucial here, because so much of her character is defined by her shoulders, one resting, one raised and flexed. It must look as if it can move with her and not inhibit the movement of her arms. It has become apparent that I must break the shoulder apparatus into components. I am so committed at this point with the shoulder spaulder sections and the complicated breastplate with its layers and twirls, and I do not want to cover them too much. I must choose the simple route, and repeat some of the elements that have occurred as I have worked my way up from toes to shoulders...so a curved piece called a shoulder cop is the logical choice, so it then resembles the knees and elbows. To those I have added what I guess would be the equivalent of a gardbrace, but I have also used the hinged panels at the back as well. These pieces relate to the tasset, the lower hinged sections of what looks like a skirt. I am having to stand on a bench now to get the angles when I weld. I keep thinking that Ironica might save me if I lose my balance! I have not been happy with the solid back panel which joined the sections of the plackart. It seemed very stiff and unyielding. And I keep speaking of movement in this sculpture. Movement when completely wrapped in steel is daunting enough. I have found with Ironica that the gesture of her pose requires lots of options, and my trials and errors always entail giving her those options. So I have created a 'spinal column' of panels which would allow her to flex a little, if only to regain her balance if the weight of her wardrobe throws her to one side or the other when she stops. Because the protection on the shoulders raises them beyond their normal height, there is a gap where they meet the clavicle. 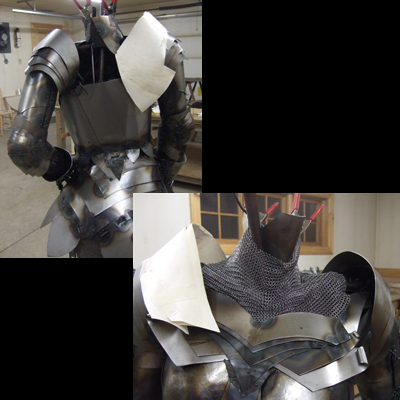 So before I complete and attach the chainmaille collar, called a pixane, I must fill that gap. I am using two curved sections which will float on the collarbone. The closest name I can find to describe it is a gorget, although that is an apparatus that covers the throat and technically this does not. But it creates a charming collar that will hopefully frame the helmet... which is now beginning to flow into my consciousness, in many manifestations! She has been an airhead for far too long. Oh, did I say airhead? She is far from that, methinks. There is a mystery about Ironica as she has emerged that I thought was cocky bravado when I began this sculpture. A woman in armour in a model's pose..I went for the obvious in judging her character. Time and struggle and dismay and joy have changed that opinion. I have learned in my life that the people I meet who are difficult, hard to approach, even unappealing at first, are the ones who are most worth the effort. The same can be said of the art and the artist. When I was creating the Chestnut Filly, (see Selected Works on this website) I had a pesky problem; although I had built the armature with four hooves on the ground, as I continued to add steel over the months, one hoof left the ground and she tottered on three for weeks and weeks. I heated and pounded and pushed, but nothing would change it. 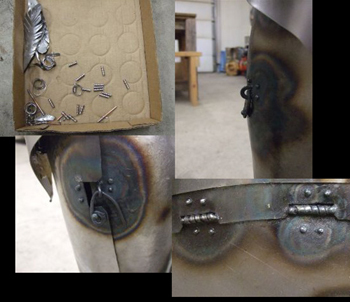 Then one day I did a simple weld on her haunch to round it out, and there was a movement. The Chestnut Filly suddenly settled on all four feet... I had hit the spot somehow, and there she was, perfectly balanced. I walked into the shop, and Ironica had turned to look at me. Somehow, though, in the months that I have been working on her, her head has turned, and I missed it happening until now. Rather than looking over the shoulder, remote and austere, she has softened her gaze and become more accessible. It is not what I planned all those months ago, but it has happened. It is what my design teacher used to call "a happy accident". My design teacher would disapprove. But Ironica and I are the majority in this discussion, with our four feet firmly planted on the ground. 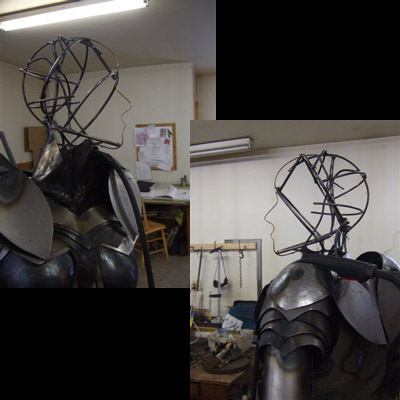 Although I have a lot of building to do under the chin and around her neck, I want to resolve some of my ideas about the helm, so that I can calculate how elaborate the jaw and neck protection should be...I do not want them to conflict. 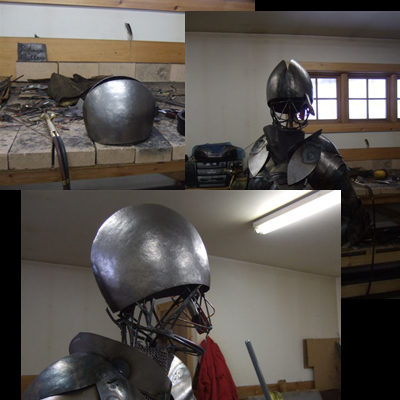 There are so many names for the helmet, depending on the style and the century; great helm, arnet, sallet, burgonet, barbute. What beautiful words they are. I will confuse the issue by trying a bit of everything. Cutting paper patterns help again, as they have throughout. I have as many shards of paper lying about as I have shards of steel. The bowl of the crown is hammered and fitted... I will be closing the top. Her hat size is 7 1/4. These are the back panels for the helmet, and now I am cutting them out on my shear. I am getting quite excited about this part... 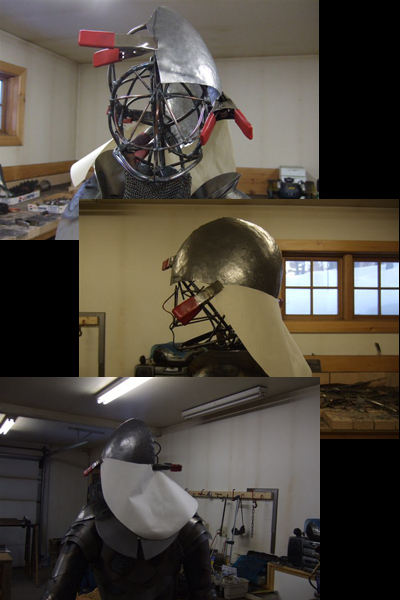 I could have gone in a dozen directions in the design, but I knew that when I finally got to the helmet, many factors would dictate its shape. I am now completing the roundel, or rondel, at the back of the helm. 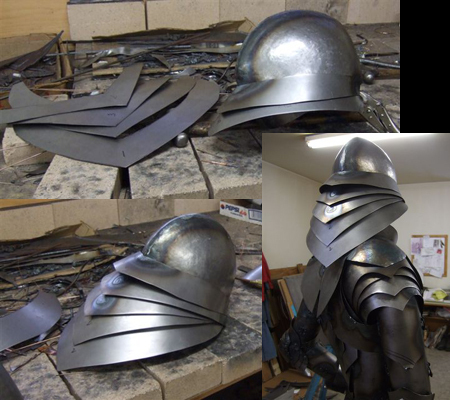 Each section is curved and welded to the crown of the helmet. I want to think that the helmet would telescope in when Ironica throws back her head to laugh. Because now I know she would laugh. Meanwhile, back to the jaw portion. This is called a bevor, which I have decided to hinge to the back neck panels, so that Ironica can perhaps surprise me another day by turning her head again. Solving the back seems to be ongoing, but I think I have it now. I have split the final section of the roundel on the helm to give it more drama. At that point I decided that the back flaps attached to the shoulders were too long, and it required replacing them, hinges and all. But now the hasps show and it adds more detail to the back panel. All the elements are coming together now that we have our heads together. I am fascinated to experience her persona, front and back, hands and feet and head. She is truly a presence as I open the door each day. Soon there will be nothing more for me to say. But our bond is not complete. 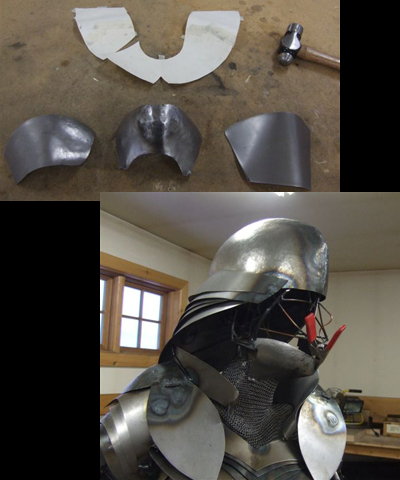 Now I must solve the visor of the great helm, making paper patterns again, trimming and fitting before I cut it out of steel. I lower my mask, and Ironica lowers hers. Somehow at this stage, there is less and less for me to say, perhaps because she has taken over the dialogue. There are probably a hundred variations in visor design, but I have chosen (or has Ironica chosen?) 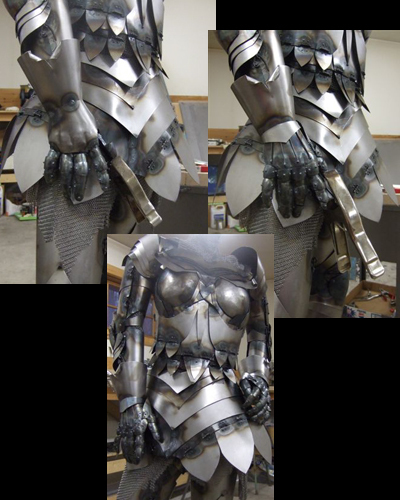 the simplest, reflecting the overall design of her armour. I would have loved to have it 'liftable', but this shot of the visor raised will be the last view like that. Not that she needs to hide... Ironica could never hide. I have spent my professional career behind a welding visor, and when I finish a work, I hand it to you and hope that you hear me and that you understand. And often, the piece says things to you that I never even thought of. In standing back from the figure, I realized that Ironica still needed a unifying element, a fanplate or gardbrace at different junctures. I had been fooling around with shapes over the months of creation of this work, and one simple shape kept insinuating itself into my thoughts and hands. So I have made a lot of work for myself, just when I thought that she and I were almost there. You can see the shape in these photos, at her ankles, knees, elbows, around her tasset pieces, and at her shoulders. Each one of them not only had to be cut, shaped and fitted, they also required hinges. But somehow, once that was done, Ironica became almost complete. I said those words in my first post, all those months ago. With each sculpture I create, I have learned that the completed work is in the eyes of several beholders. Each interpretation is valid, because each of us approaches art as individuals, and with many senses... our sense of sight, our sense of touch, our sense of space and proportion and design, our sense of the past, the present, and the future, and sometimes, our sense of humour. For me, she is a charming but silent harlequin, complicated, ironic, of course, and full of ambiguities. You know she has a heart. I sometimes I feel as if all my courage is welded inside her. And when I look into the tiny gap between helmet and visor, she seems to have a brain. Now, it’s your turn to decide who, and what, she is. I am different now, after a year and a bit, as would be expected, not just because of Ironica. Life continues on its natural course over the extended period of a work such as this. I see, as usual, a million things I would have done differently, in my life and in this sculpture, but once she is signed, I will not change her. Now I must work with the change in me. I must begin new works, from my heart and my brain, in order to regain my courage. The added component has been this diary, and the people who have followed it. It has been an enriching aspect of this project to have feedback, unusual in this case because it followed along before the sculpture was complete. I usually allow only a chosen few into that fragile process. With the diary I have found old friends and made new ones. Art is communication, and this has been a two way conversation with all of you. The decision from the start to let the work rise from the feet up without a plan actually invited another dialogue; I asked the questions, and Ironica gave me the answers. She will continue now without me. I grieve now, as I step back from her.